Aquabuoy Technology is a system that uses ocean wave energy to generate usable power. Aquabuoy systems or wave energy converters are small buoy-shaped arrangements that convert the vertical component of the kinetic energy of the wave to pressurize a sea water column using a two stroke hose pump. When deployed in a group, Aquabuoy systems can generate power in a range from kilowatts to megawatts. The power thus developed can be supplied to nearby coastal areas using underwater transmission lines. An Aquabuoy power plant consists of several aquabuoy systems deployed together several miles away from the seashore. Aquabuoys are light in weight and harmless to both marine life and the environment. Piston – A small disc located exactly at the center. Out of the four main components, the acceleration tube, piston and hose pump together form the power take off system. The acceleration tube resembles a hollow cylinder attached right below the buoy. This hollow tube is open at both ends to facilitate the entry and exit of water. The hollow acceleration tube also accommodates a light disk or piston exactly at the center. The two hose pumps are located at either sides of the piston to the cylinder’s ends. The hose pump is made from a steel reinforced rubber tube. When the sea water enters inside the cylinder the hose elongates, decreasing the internal volume. As the volume decreases, a pressure is created on the sea water, making the hose act as a pump. The pressurized water is then pushed by the hose into a chamber wherein it moves a turbine, which is connected to a generator. Many such buoys together form an aquabuoy power plant. All the aquabuoy systems are connected to sub sea transmission lines that take the power generated ashore. The aquabuoy systems are made in such a way that they can utilize energy even from the smallest waves. These small yet powerful buoys are simple in construction and also require less maintenance. One more advantage of aquabuoy is that because of its simple yet robust design, it can survive the harshest of weather condition without getting affected. Moreover, unlike conventional offshore plants that gets affected by oil spills, aquabuoy remains unaffected by oil. Some of these aquabuoys are also provided with other renewable energy equipments such as small wind mills and solar panels. The first Aquabuoy power plant has been deployed off the coast of Newport, Oregon by a company called Finavera Renewables. 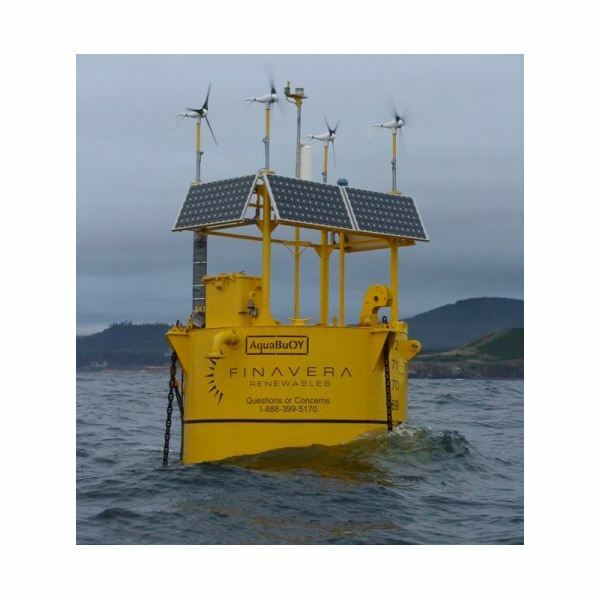 The company has also provided the systems with an additional diagnostic and monitoring equipments that measure the weather conditions and ocean currents and send it back to the land. This helps the company to analyze if the specific area is suitable for the next deployment of power plant.